Owners Laura Berland-Wyman and Lisa Berland are motivated by a passion for transforming pieces to give them new life. They credit their mother with instilling the “do-it-yourself gene” and teaching them some of the varied skills they draw upon in their work. An old time curb alert aficionado in NYC, mom rescued and revived many of the furnishings they grew up with -- she modernized an antique oak table by replacing the pedestal with hairpin legs and repurposing a rattan chair into a hanging lamp shade. Both Lisa and Laura have fine art training and Laura was a decorative painter for many years. They also have studied upholstery and wood working at the Elliot School in Jamaica Plain. The sisters started out in 2011 experimenting with some painted pieces out of a small studio in West Concord. The business seemed to have traction and with growing interest in mid century pieces, they launched Retrocraft Design studio and moved into a much larger space also in West Concord. Our goal is to re-envision vintage furnishings to enhance the contemporary home. We seek out unusual pieces of varied styles, with classic lines and sturdy construction. With a creative eye, we envision a treatment that best highlights the beauty of the piece. In our opinion decades of use can lend an appealing patina to vintage furniture--in those cases, we leave it alone. Our aim is to preserve the desirable marks of age to enhance the beauty of the piece. However, we ensure that each piece is structurally sound, drawers operate smoothly, cabinet doors open and close properly, chair and table legs are stable. We may decide to alter the look with the addition of paint or a colored stain, or we may refinish the piece to enhance the quality of the varied woods such as walnut, teak and mahogany that were commonly used back in the day. For example, we love the rich patina of vintage Danish Modern teak. When we are fortunate enough to come across these pieces, after sanding we whip out the time-honored Danish oil. Our offerings include mid century designers such as Paul McCobb, George Nelson, Russell Wright, Jens Risom, Kai Kristiansen, Paul Cherner, Ray and Charles Eames, Milo Baughman, Adrian Pearsall as well as recognizable American manufacturers such as Lane, American of Martinsville, Bassett, Kent Coffey, Heywood Wakefield, Conant Ball, Broyhill and Dixie. 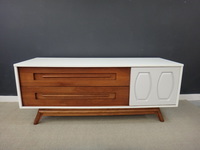 We also offer vintage Danish modern pieces. The nature of the vintage business is a treasure hunt – we never know exactly what we will find. Consequently, our showroom is a constantly changing selection of varied items. However, we try to maintain a robust selection of bureaus, credenzas, tables and seating. We encourage you to come and browse in addition to signing up for our email flyer with pictures and links of our newest items. If you have a favorite piece of furniture that needs restoration, upholstory, refinishing or repair, please feel free to contact us about your project. We work closely with a number of well-established professionals in related fields. In some cases we can refer you and in others we can coordinate with these professionals on your project.